When the opportunity arose to test and review Jan Marini products for a sponsored post, I was hesitant. I had heard of Jan Marini before and never associated the brand with being “green” and/or nontoxic. But after reviewing the brand’s product offerings and their ingredients to see if there was anything that would possibly meet my requirements – no endocrine disruptors, no fragrances, no harmful chemicals – to my surprise, I discovered Jan Marini offers a number of nontoxic products that are paraben-free, phthalate-free and sodium lauryl sulfate-free. So I decided to test out a variety of products for my skin concerns. This post is sponsored by Jan Marini, but all opinions are my own. Jan Marini is one heck of a knowledgeable woman! The brand insisted upon conducting a phone consultation to be sure to send me the appropriate products and low and behold the founder herself, Jan Marini, called me! We geeked out over skincare for over an hour and I learned so much: 75% of the time dark under-eye circles are due to sinus congestion; sensitive skin CAN use acids and often sensitivity to acid containing products isn’t actually due to the acids themselves, but secondary ingredients like fragrances or essential oils; azealic acid helps ameliorate rosacea, acne and lightens\ hyperpigmentation; and the MOST IMPORTANT piece of advice I took away from our whole conversation – dry skin isn’t always dry skin, but possibly over moisturized and under-exfoliated skin. Say, what!? This last bit of information really stuck with me. I wondered if my super dry skin was in fact due to over-moisturizing and under-exfoliating thanks to an aversion to acids. Jan explained that perhaps what my skin really needed was acids to encourage cell turnover, strengthen my fragile skin and stimulate collagen. My stomach churned at the thought of using strong acids. After being burned by acids before and dealing with the perils of perioral dermatitis, I had come to fear acids. But Jan assuaged my fears and assured me she felt confident if we went slow, my skin would be able to tolerate and eventually thrive using acids. She believed the exfoliation would encourage cell renewal, reduce the dullness I’d been experiencing, and in-fact strengthen my skin. She argued that sensitive skin like mine was actually weak skin that needed to be stimulated and nourished. Her knowledge and experience comforted me and I agreed to test and explore acids once again. 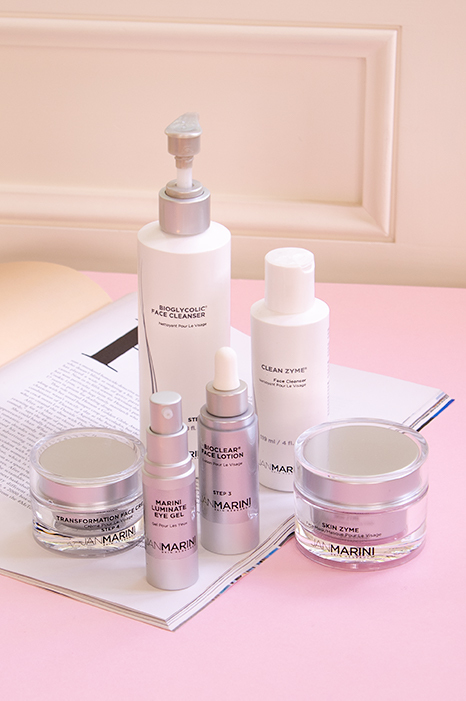 I was sent the following Jan Marini products to address my skin concerns (pigment, dullness, sensitivity, breakouts). *Though the brand sent the above products to me, I wasn’t able to test all of them. The following products I did not test: Transformative Face Lotion and Luminate Eye Gel since both contain Vitamin A derivatives which I’m avoiding while breastfeeding; the C-Estra Serum is one of the few Jan Marini products in their line that does contain parabens; and the Antioxidant SPF I did not test because it contains the chemical sunscreen oxybenzene which I’m also avoiding while breastfeeding. Of the remaining four products I was able to test, I fell in love with the Jan Marini BioClear Lotion – as in may never go without this product ever again. And I really like/would highly recommend the Jan Marini Clean Zyme set and BioGlycolic Cleanser. The Jan Marini Skin Zyme Mask is good, but I found wasn’t needed since the Clean Zyme does such a great job at eating away dead skin. Read on below for my in-depth review of these four products. Review: If you’re suffering from dry, congested, sensitive skin, I would highly recommend trying this cleanser. I was blown away that my skin tolerated the glycolic acid so well. I saw a lot of textural improvement in my skin within the first few uses and experienced no burning, stinging, dryness or irritation. I found using this cleanser in the evening works best for me. When I used it 2x a day as suggested, I experienced pinkness on my cheeks and chin. The Jan Marini BioGlycolic Cleanser reminds me a lot of the Biologique Recherche Lait VP milk cleanser I tested last year. Both are non-foaming, gentle cleansers containing acids, but I found the Jan Marini cleanser to be gentler. The BR Lait VP uses a blend of lactic and salicylic acids, while this one by Jan Marini only contains glycolic. Lactic acid is definitely the gentlest acid, but salicylic acid can be sensitizing for me depending on the concentration since it’s a small particle and can go deeper into the skin. Glycolic on the other hand can be very strong if formulated in a high concentration, but it mainly exfoliates the top layer of skin. The Biologique Recherche Lait VP caused some sensitivity and light purging initially, which I didn’t experience with the Jan Marini cleanser. Now, if you’re concerned with pure ingredients like I am, you might be a little hesitant to see ammonium laurel sulfate listed as an ingredient in this product. But don’t worry. The name is eerily similar to an ingredient many avoid, SLS or sodium laurel sulfate, but ALS, while an ionic surfactant like SLS, has a very different molecular structure than SLS making it much safer. SLS has a very small molecule structure meaning it can penetrate the skin easily causing irritation and inflammation. ALS on the other hand is much larger and heavier in size, therefore unable to reach the delicate under layers of cells. Ammonium laurel sulfate is rated the lowest rating on the EWG, a 1, which indicates it’s safe. Overall, I am so surprised by how gentle this acid cleanser is and would recommend it highly for sensitive skin types looking to improve their skin texture. Texture: Non-foaming gel. The texture is almost exactly like that of other non-foaming gentle cleansers like Cetaphil and Cerave. There are no foaming agents, thus eliminating any stripping action. The skin’s natural oils are protected. Tip: Always apply on DRY skin and rinse with a wash cloth soaked in cool water. Review: Of all of the Jan Marini products I tested, this one is by far my favorite! It’s a very powerful product that contains a variety of acids – glycolic, salicylic and azelaic – that work to exfoliate the top layer of skin, inside of the pores, kill p. Acnes bacteria and lighten post-inflammatory pigmentation. When I started testing this product, I had to go slow. I began using it every other night, then every night and finally morning and night. My skin needed to adjust, but once it did, I began seeing amazing benefits! The azelaic acid in this product is the star ingredient for me, and I’m so surprised it’s not an ingredient more people use/discuss. It is commonly prescribed by dermatologists to combat acne and pigment because it kills p. Acnes bacteria, reduces inflammation and reduces making it great for rosacea sufferers, and it lightens pigment! Even though over-the-counter formulations must contain less than 10% concentration, they’re still powerful enough to produce real results. I’m hooked on azelaic acid after using this product! My skin is so bright and clear. It has helped fade stubborn red acne marks quicker and better than any other product I’ve tried. Overall, the Jan Marini BioClear Lotion has revived my love of acids! Tip: Use sparingly, a little goes a long way. And apply on dry skin. Review: Both of these products use papaya fruit enzymes as their main active exfoliant. The great thing about fruit enzymes is that they only eat away at dead skin cells and leave healthy cells intact. This means, as Jan explained to me, post-laster patients can use these products to help eat away at flaking, dead skin post treatments because they won’t disrupt or irritate the skin. I found they both did a great job at exfoliating and smoothing my skin without any irritation, but they seemed redundant. After using and loving the Clean Zyme, I didn’t feel I really needed to use the Skin Zyme mask afterwards. I’m sure doing so, gives a little extra and deeper boost, but the Clean Zyme wash is $30 and the Skin Zyme mask is $60 – so I feel like you could do with just purchasing the mask and reap a lot of benefits. The Clean Zyme wash is meant to be used in place of your cleanser 2-4x a week. But I found I liked the results so much that I had to resist the temptation to use it nightly I love it so much! Texture: Clean Zyme wash has a gel texture. Skin Zyme mask has a gel cream texture. Tip: Buy the Clean Zyme cleanser and see how your skin does with just that. If you love it and want an extra boost and don’t mind the extra splurge, then go for the Skin Zyme mask. For more about the brand visit www.janmarini.com.